Diamonds are a girl's best friend, so it only makes sense that Prince Charleswould gift Meghan Markle a diamond tennis bracelet. The delicate chain was reportedly gifted to the Duchess of Sussex just before her fairy tale wedding to Prince Harryin May. Meghan has been spotted sporting the chic piece of jewelry on multiple occasions, including at the Prince of Wales' 70th birthday, leading royal watchers to believe it was a wedding gift. She once again opted to wear the bracelet for her visit to Suva, Fiji, where she wore a dress by Zimmerman and a Stephen Jones hat. It is unclear who the designer of the dainty piece of jewelry is, but one thing's for sure: Prince Charles has great taste. Following their grand welcome to the island, Meghan and Harry changed into their formal wear for the Fijian state dinner. At the black tie event, the pregnant Duchess wore a full-length cape dress in blue, which was designed by SAFiYAA's Daniela Karmuts. 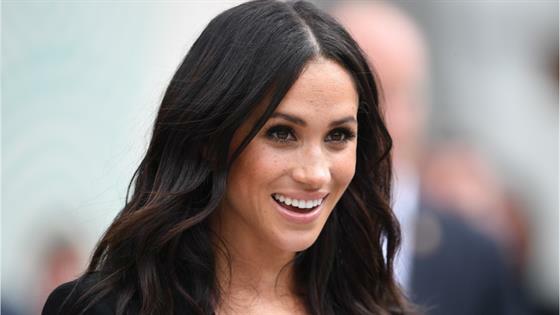 For jewelry, Markle kept the bracelet on, but added a touch of glam by wearing dangling diamond earrings. Kensington Palace said the elaborate earrings are on loan. Meghan's choice of jewelry is not the only way the Duke and Duchess of Sussex paid tribute to their family back in England. They also recreated the memorable moment when Her Majesty Queen Elizabeth II and Prince Phillip visited the island nation in 1953. The pair stood in the same spot on the balcony of the Grand Pacific Hotel in Suva and waved at the sea of people who excitedly gathered to see the Royal couple in the flesh. Next up on their tour is a visit to the University of the South Pacific, where Harry said he wishes to meet "the young leaders from all walks of life." He added, "The health and sustainability of this planet depends on the younger generation, and they are full of optimism so let's listen to them." To see more of Meghan's fashionable looks from their tour, check out the gallery above!